Earlier this year, we launched Android Wear 2.0 which featured the first "on-device" machine learning technology for smart messaging. 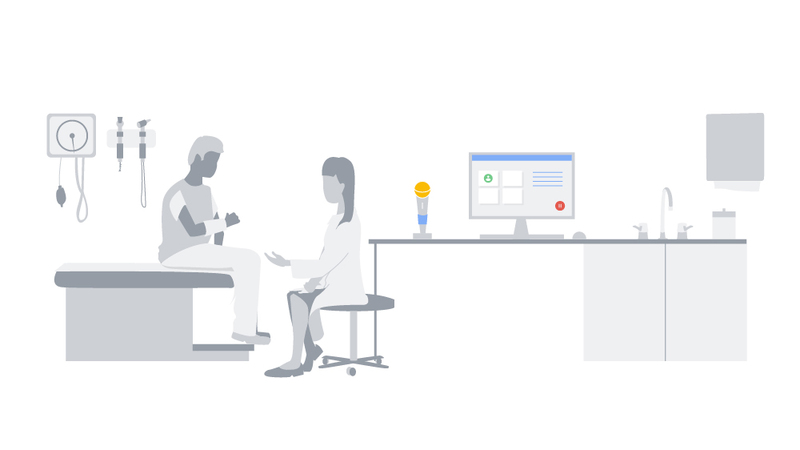 This enabled cloud-based technologies like Smart Reply, previously available in Gmail, Inbox and Allo, to be used directly within any application for the first time, including third-party messaging apps, without ever having to connect to the cloud. So you can respond to incoming chat messages on the go, directly from your smartwatch. Today, we announce TensorFlow Lite, TensorFlow’s lightweight solution for mobile and embedded devices. This framework is optimized for low-latency inference of machine learning models, with a focus on small memory footprint and fast performance. As part of the library, we have also released an on-device conversational model and a demo app that provides an example of a natural language application powered by TensorFlow Lite, in order to make it easier for developers and researchers to build new machine intelligence features powered by on-device inference. This model generates reply suggestions to input conversational chat messages, with efficient inference that can be easily plugged in to your chat application to power on-device conversational intelligence. The on-device conversational model we have released uses a new ML architecture for training compact neural networks (as well as other machine learning models) based on a joint optimization framework, originally presented in ProjectionNet: Learning Efficient On-Device Deep Networks Using Neural Projections. This architecture can run efficiently on mobile devices with limited computing power and memory, by using efficient “projection” operations that transform any input to a compact bit vector representation — similar inputs are projected to nearby vectors that are dense or sparse depending on type of projection. For example, the messages “hey, how's it going?” and “How's it going buddy?”, might be projected to the same vector representation. Using this idea, the conversational model combines these efficient operations at low computation and memory footprint. 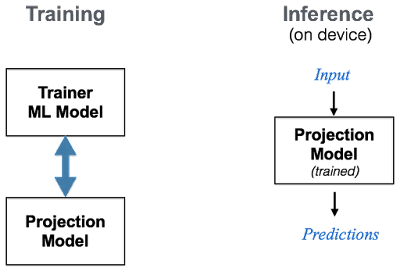 We trained this on-device model end-to-end using an ML framework that jointly trains two types of models — a compact projection model (as described above) combined with a trainer model. 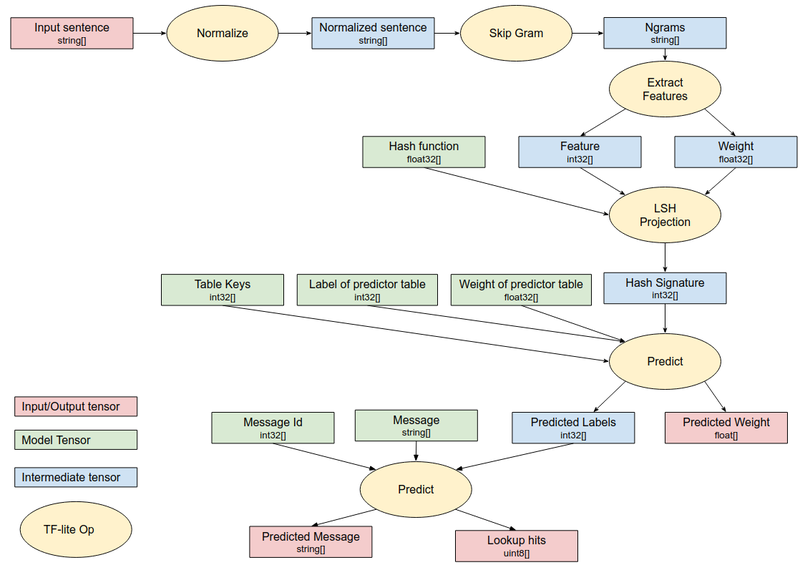 The two models are trained in a joint fashion, where the projection model learns from the trainer model — the trainer is characteristic of an expert and modeled using larger and more complex ML architectures, whereas the projection model resembles a student that learns from the expert. During training, we can also stack other techniques such as quantization or distillation to achieve further compression or selectively optimize certain portions of the objective function. Once trained, the smaller projection model is able to be used directly for inference on device. For inference, the trained projection model is compiled into a set of TensorFlow Lite operations that have been optimized for fast execution on mobile platforms and executed directly on device. The TensorFlow Lite inference graph for the on-device conversational model is shown here. TensorFlow Lite execution for the On-Device Conversational Model. The open-source conversational model released today (along with code) was trained end-to-end using the joint ML architecture described above. Today’s release also includes a demo app, so you can easily download and try out one-touch smart replies on your mobile device. The architecture enables easy configuration for model size and prediction quality based on application needs. You can find a list of sample messages where this model does well here. The system can also fall back to suggesting replies from a fixed set that was learned and compiled from popular response intents observed in chat conversations. The underlying model is different from the ones Google uses for Smart Reply responses in its apps1. Interestingly, the ML architecture described above permits flexible choices for the underlying model. 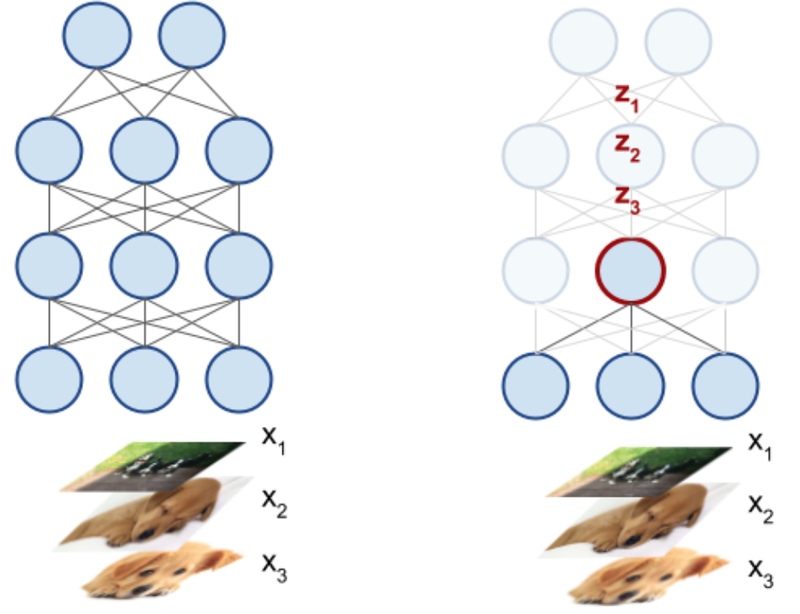 We also designed the architecture to be compatible with different machine learning approaches — for example, when used with TensorFlow deep learning, we learn a lightweight neural network (ProjectionNet) for the underlying model, whereas a different architecture (ProjectionGraph) represents the model using a graph framework instead of a neural network. The joint framework can also be used to train lightweight on-device models for other tasks using different ML modeling architectures. As an example, we derived a ProjectionNet architecture that uses a complex feed-forward or recurrent architecture (like LSTM) for the trainer model coupled with a simple projection architecture comprised of dynamic projection operations and a few, narrow fully-connected layers. The whole architecture is trained end-to-end using backpropagation in TensorFlow and once trained, the compact ProjectionNet is directly used for inference. Using this method, we have successfully trained tiny ProjectionNet models that achieve significant reduction in model sizes (up to several orders of magnitude reduction) and high performance with respect to accuracy on multiple visual and language classification tasks (a few examples here). 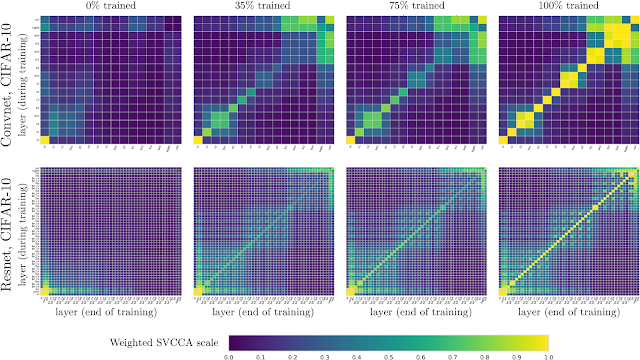 Similarly, we trained other lightweight models using our graph learning framework, even in semi-supervised settings. ML architecture for training on-device models: ProjectionNet trained using deep learning (left), and ProjectionGraph trained using graph learning (right). 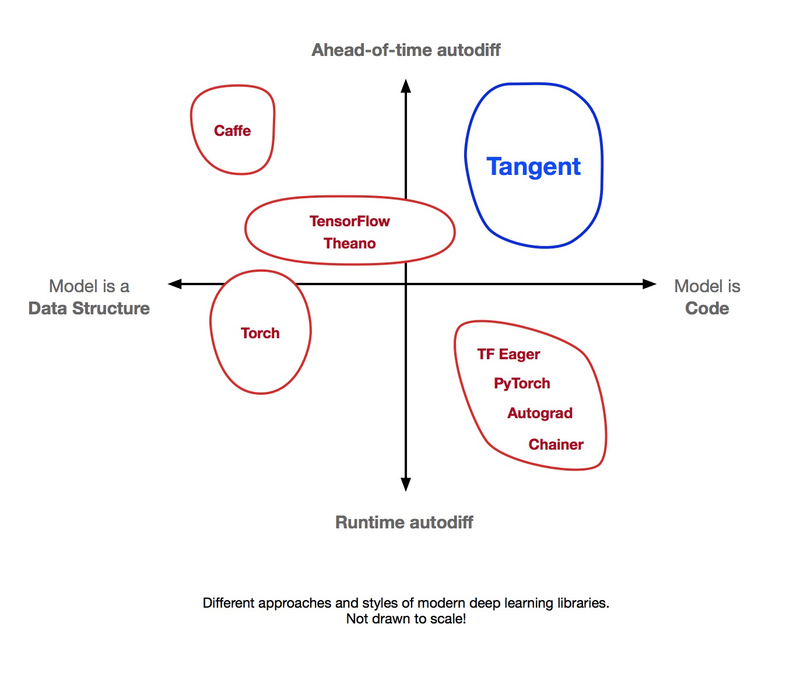 We will continue to improve and release updated TensorFlow Lite models in open-source. We think that the released model (as well as future models) learned using these ML architectures may be reused for many natural language and computer vision applications or plugged into existing apps for enabling machine intelligence. We hope that the machine learning and natural language processing communities will be able to build on these to address new problems and use-cases we have not yet conceived. Yicheng Fan and Gaurav Nemade contributed immensely to this effort. Special thanks to Rajat Monga, Andre Hentz, Andrew Selle, Sarah Sirajuddin, and Anitha Vijayakumar from the TensorFlow team; Robin Dua, Patrick McGregor, Andrei Broder, Andrew Tomkins and the Google Expander team. In 2007, we introduced Google Street View, enabling you to explore the world through panoramas of neighborhoods, landmarks, museums and more, right from your browser or mobile device. The creation of these panoramas is a complicated process, involving capturing images from a multi-camera rig called a rosette, and then using image blending techniques to carefully stitch them all together. However, many things can thwart the creation of a "successful" panorama, such as mis-calibration of the rosette camera geometry, timing differences between adjacent cameras, and parallax. And while we attempt to address these issues by using approximate scene geometry to account for parallax and frequent camera re-calibration, visible seams in image overlap regions can still occur. Left: A Street View car carrying a multi-camera rosette. Center: A close-up of the rosette, which is made up of 15 cameras. Right: A visualization of the spatial coverage of each camera. Overlap between adjacent cameras is shown in darker gray. Left: The Sydney Opera House with stitching seams along its iconic shells. 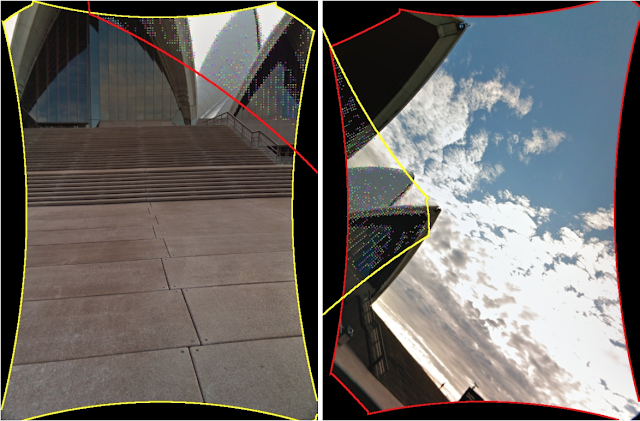 Right: The same Street View panorama after optical flow seam repair. In order to provide more seamless Street View images, we’ve developed a new algorithm based on optical flow to help solve these challenges. The idea is to subtly warp each input image such that the image content lines up within regions of overlap. This needs to be done carefully to avoid introducing new types of visual artifacts. The approach must also be robust to varying scene geometry, lighting conditions, calibration quality, and many other conditions. To simplify the task of aligning the images and to satisfy computational requirements, we’ve broken it into two steps. The first step is to find corresponding pixel locations for each pair of images that overlap. Using techniques described in our PhotoScan blog post, we compute optical flow from one image to the other. This provides a smooth and dense correspondence field. We then downsample the correspondences for computational efficiency. We also discard correspondences where there isn’t enough visual structure to be confident in the results of optical flow. The boundaries of a pair of constituent images from the rosette camera rig that need to be stitched together. An illustration of optical flow within the pair’s overlap region. Extracted correspondences in the pair of images. For each colored dot in the overlap region of the left image, there is an equivalently-colored dot in the overlap region of the right image, indicating how the optical flow algorithm has aligned the point. These pairs of corresponding points are used as input to the global optimization stage. Notice that the overlap covers only a small portion of each image. The second step is to warp the rosette’s images to simultaneously align all of the corresponding points from overlap regions (as seen in the figure above). When stitched into a panorama, the set of warped images will then properly align. This is challenging because the overlap regions cover only a small fraction of each image, resulting in an under-constrained problem. To generate visually pleasing results across the whole image, we formulate the warping as a spline-based flow field with spatial regularization. The spline parameters are solved for in a non-linear optimization using Google’s open source Ceres Solver. A visualization of the final warping process. Left: A section of the panorama covering 180 degrees horizontally. Notice that the overall effect of warping is intentionally quite subtle. Right: A close-up, highlighting how warping repairs the seams. Our approach has many similarities to previously published work by Shum & Szeliski on “deghosting” panoramas. Key differences include that our approach estimates dense, smooth correspondences (rather than patch-wise, independent correspondences), and we solve a nonlinear optimization for the final warping. The result is a more well-behaved warping that is less likely to introduce new visual artifacts than the kernel-based approach. Left: A close-up of the un-repaired panorama. Middle: Result of kernel-based interpolation. This fixes discontinuities but at the expense of strong wobbling artifacts due to the small image overlap and limited footprint of kernels. Right: Result of our global optimization. Special thanks to Bryan Klingner for helping to integrate this feature with the Street View infrastructure. We're extremely grateful to our co-author, Ludwig Schurbert, who made incredible contributions to our paper and especially to the interactive visualizations. We intend to develop Tangent together as a community. We welcome pull requests with fixes and features. Happy differentiating! Bart van Merriënboer contributed immensely to all aspects of Tangent during his internship, and Dan Moldovan led TF Eager integration, infrastructure and benchmarking. Also, thanks to the Google Brain team for their support of this post and special thanks to Sanders Kleinfeld, Matt Johnson and Aleks Haecky for their valuable contribution for the technical aspects of the post. A few months ago, we introduced our AutoML project, an approach that automates the design of machine learning models. While we found that AutoML can design small neural networks that perform on par with neural networks designed by human experts, these results were constrained to small academic datasets like CIFAR-10, and Penn Treebank. We became curious how this method would perform on larger more challenging datasets, such as ImageNet image classification and COCO object detection. Many state-of-the-art machine learning architectures have been invented by humans to tackle these datasets in academic competitions. In Learning Transferable Architectures for Scalable Image Recognition, we apply AutoML to the ImageNet image classification and COCO object detection dataset -- two of the most respected large scale academic datasets in computer vision. These two datasets prove a great challenge for us because they are orders of magnitude larger than CIFAR-10 and Penn Treebank datasets. For instance, naively applying AutoML directly to ImageNet would require many months of training our method. We redesigned the search space so that AutoML could find the best layer which can then be stacked many times in a flexible manner to create a final network. 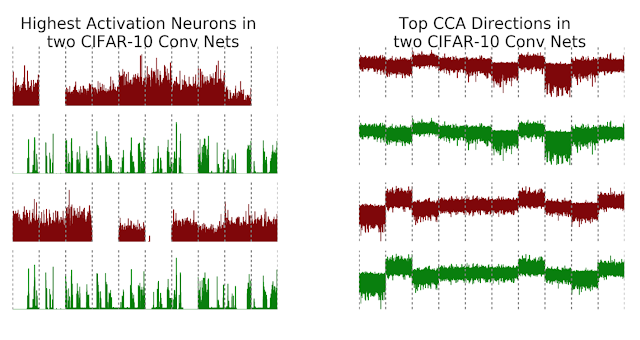 We performed architecture search on CIFAR-10 and transferred the best learned architecture to ImageNet image classification and COCO object detection. With this method, AutoML was able to find the best layers that work well on CIFAR-10 but work well on ImageNet classification and COCO object detection. These two layers are combined to form a novel architecture, which we called “NASNet”. Our NASNet architecture is composed of two types of layers: Normal Layer (left), and Reduction Layer (right). These two layers are designed by AutoML. 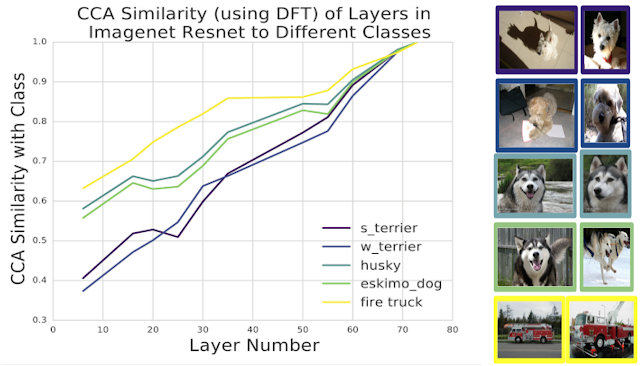 On ImageNet image classification, NASNet achieves a prediction accuracy of 82.7% on the validation set, surpassing all previous Inception models that we built [2, 3, 4]. Additionally, NASNet performs 1.2% better than all previous published results and is on par with the best unpublished result reported on arxiv.org . Furthermore, NASNet may be resized to produce a family of models that achieve good accuracies while having very low computational costs. For example, a small version of NASNet achieves 74% accuracy, which is 3.1% better than equivalently-sized, state-of-the-art models for mobile platforms. 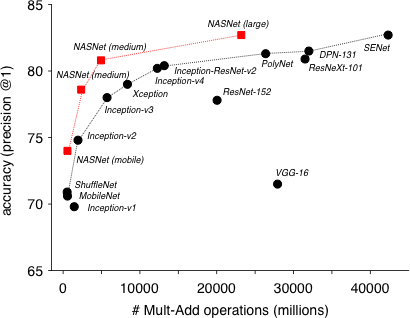 The large NASNet achieves state-of-the-art accuracy while halving the computational cost of the best reported result on arxiv.org (i.e., SENet) . Accuracies of NASNet and state-of-the-art, human-invented models at various model sizes on ImageNet image classification. We also transferred the learned features from ImageNet to object detection. In our experiments, combining the features learned from ImageNet classification with the Faster-RCNN framework  surpassed previous published, state-of-the-art predictive performance on the COCO object detection task in both the largest as well as mobile-optimized models. Our largest model achieves 43.1% mAP which is 4% better than the previous, published state-of-the-art. Example object detection using Faster-RCNN with NASNet. We suspect that the image features learned by NASNet on ImageNet and COCO may be reused for many computer vision applications. 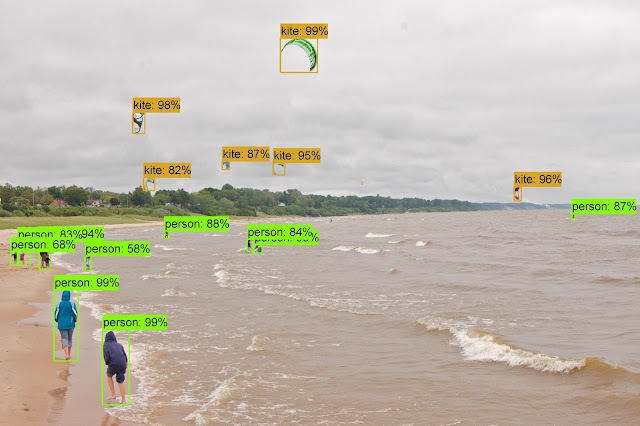 Thus, we have open-sourced NASNet for inference on image classification and for object detection in the Slim and Object Detection TensorFlow repositories. We hope that the larger machine learning community will be able to build on these models to address multitudes of computer vision problems we have not yet imagined. Special thanks to Jeff Dean, Yifeng Lu, Jonathan Huang, Vivek Rathod, Sergio Guadarrama, Chen Sun, Jonathan Shen, Vishy Tirumalashetty, Xiaoqiang Zheng, Christian Sigg and the Google Brain team for the help with the project. Going Deeper with Convolutions, Christian Szegedy, Wei Liu, Yangqing Jia, Pierre Sermanet, Scott Reed, Dragomir Anguelov, Dumitru Erhan, Vincent Vanhoucke, and Andrew Rabinovich. CVPR, 2015. Rethinking the inception architecture for computer vision, Christian Szegedy, Vincent Vanhoucke, Sergey Ioffe, Jonathon Shlens, and Zbigniew Wojna. CVPR, 2016. Squeeze-and-Excitation Networks, Jie Hu, Li Shen and Gang Sun. Arxiv, 2017. Faster R-CNN: Towards Real-Time Object Detection with Region Proposal Networks, Shaoqing Ren, Kaiming He, Ross Girshick and Jian Sun. NIPS, 2015. Out-of-the-box optimized serving and customizability: We now offer a pre-built canonical serving binary, optimized for modern CPUs with AVX, so developers don't need to assemble their own binary from our libraries unless they have exotic needs. At the same time, we added a registry-based framework, allowing our libraries to be used for custom (or even non-TensorFlow) serving scenarios. Granular batching: A key technique we employ to achieve high throughput on specialized hardware (GPUs and TPUs) is "batching": processing multiple examples jointly for efficiency. 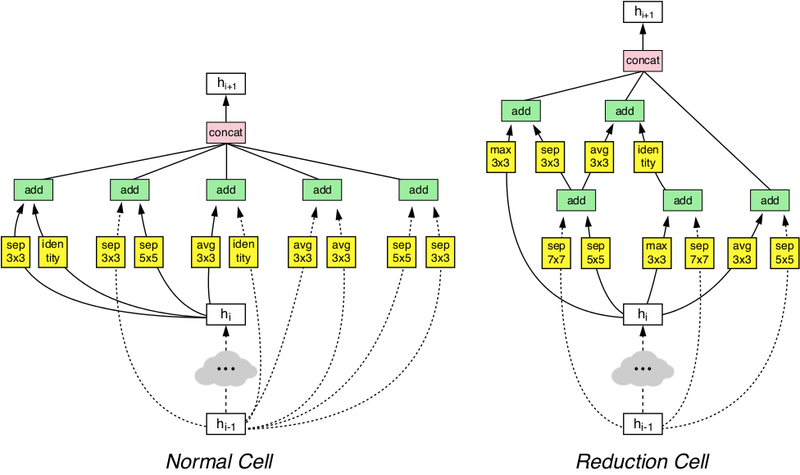 We are developing technology and best practices to improve batching to: (a) enable batching to target just the GPU/TPU portion of the computation, for maximum efficiency; (b) enable batching within recursive neural networks, used to process sequence data e.g. text and event sequences. We are experimenting with batching arbitrary sub-graphs using the Batch/Unbatch op pair.